CARLSBAD — City of Carlsbad and Eddy County administrators cited “severe risk of electrical shock and continued noncompliance” as the reasoning behind the decision to cut the power at the Westwinds Mobile Home Park, located on the 2400 block of Harding Street, according to City Administrator Steve Mc- Cutcheon. The property is located in Eddy County, outside of City of Carlsbad limits, but the City has an agreement with the State of New Mexico to provide electrical inspections within a five mile radius of city limits. The potential concern was first reported by an Eddy County Sheriff’s Department employee visiting the mobile home park. 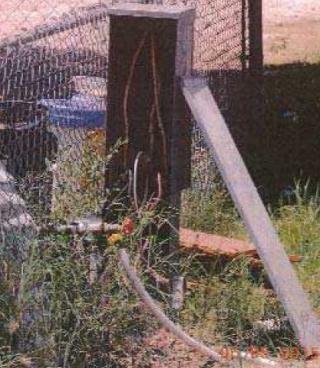 The deputy contacted county officials, who then notified the City’s electrical inspector. Numerous other complaints were made. When Electrical Inspector Jeff Burger visited the mobile home park in early June, he reported several violations, most notably the fact that there were live wires coming out of multiple 3-foot tall pedestals close to standing water on the park’s property. The property owner was given 30 days to remedy the situation. On July 10, the property owner was given an additional week to resolve the matter. The City’s electrical inspector ordered the power cut on July 28 after the safety issues were deemed to be unresolved. “There was some attempt at work done during that time, but it was an insufficient effort and not corrected in the proper manner,” McCutcheon explained. said Wes Reeves, spokesman for Xcel Energy. “Substandard or faulty service connections can lead to serious injury. So we will not restore service to the mobile home park until the facilities are repaired and can pass inspection from city code enforcement officials. “We recognize the City’s jurisdiction and concur that the identified hazards, if not addressed, present a health and safety risk to the residents of the park,” added Eddy County Planner Amanda Melvin. Because the electrical system has been tagged as unsafe, the process of restoring power will take a long time. The owner of the property will now have to file a plan for the repairs to the mobile park’s electrical system and hire a licensed contractor. Once the plans are approved, it will need to be installed and inspected to make sure it meets code. Some residents of the park are currently using generators, and McCutcheon said inspectors will be checking to make sure the generators are correctly hooked up. Linda Dodd, Executive Director of the United Way of Carlsbad & South Eddy County, said the United Way’s 2-1-1 program will help residents by distributing ice and fuel gift cards. The United Way is also looking to partner with other organizations to provide an extended solution.